Price elasticity Measures how much the quantity demanded of a good changes when its price changes. If answer is between 0 and -1: the relationship is inelastic. If the answer is between 1 and infinity: the relationship is elastic. 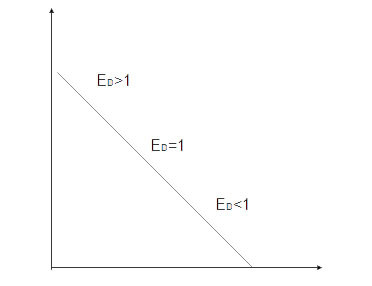 Above mid-point of a straight line, demand is elastic,ED >1. 1. Number of close substitutes within the market - The more (and closer) substitutes available in the market the more elastic demand will be in response to a change in price. In this case, the substitution effect will be quite strong. 2. Luxuries and necessities - Necessities tend to have a more inelastic demand curve, whereas luxury goods and services tend to be more elastic. For example, the demand for opera tickets is more elastic than the demand for urban rail travel. The demand for vacation air travel is more elastic than the demand for business air travel. 3. Percentage of income spent on a good - It may be the case that the smaller the proportion of income spent taken up with purchasing the good or service the more inelastic demand will be. 4. Habit forming goods - Goods such as cigarettes and drugs tend to be inelastic in demand. Preferences are such that habitual consumers of certain products become de-sensitised to price changes. 5. Time period under consideration - Demand tends to be more elastic in the long run rather than in the short run. For example, after the two world oil price shocks of the 1970s - the "response" to higher oil prices was modest in the immediate period after price increases, but as time passed, people found ways to consume less petroleum and other oil products. This included measures to get better mileage from their cars; higher spending on insulation in homes and car pooling for commuters. The demand for oil became more elastic in the long-run. Find out how to book free flights with Travel Hacking. Booking Buddy is the most popular travel search website, that you can use to compare travel deals from all the large travel booking websites.